It’s that time of year when, as everyone scrambles for the coast, we want to get into the water and see what all our beach destination has to offer. When you come to Key Largo, you’ll definitely want to check out not only the shores but the waterways as well. When you book an adventure tour with Keys Skis Watersports, you’ll not only get firsthand access to some of the most pristine waterways and shores in the Upper Keys but also up-close-and-personal views of the unique flora and fauna that make Key Largo so unique. While we offer numerous adventure tours, our kayak tours get you as close to the water as possible. 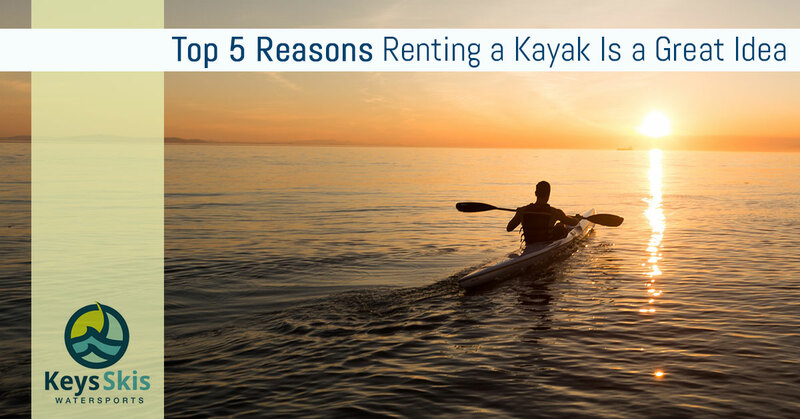 Below we’ve compiled some of our favorite reasons for renting a kayak in Key Largo. Take a peek below for some rental motivation. There’s nothing quite like launching your kayak into the Gulf, Atlantic, or inland waterways surrounding Key Largo. Especially, sunset is an excellent time to leave the shores behind and gently glide towards the beckoning horizon. Once you leave the shores, you’ll be transported to a place of calm, surrounded by some of the world’s most popular waters — and likely escorted by sea life that loves to make an appearance. If a lackadaisical outing on Key Largo’s waters with a host of water-faring creatures at sunset sounds like your way to kick back, relax, and take in sights often unseen by visitors, then kayak rental is the right choice for you. Not all kayak outings have to go at a leisurely pace. If you’ve come to Key Largo in search of adventure, then Keys Skis is your go-to for satiating your adrenaline rush. While kayak rental won’t bring the same sort of thrills that our parasailing adventure tours offer, kayak tours are perfectly capable of delivering excitement not found on the shore; how else can you get a firsthand glimpse of the distant shore while completely surrounded by some of the States’ most prized waterways? Often, visitors marvel at how thrilling it is to be so far from shore (but not too far; we’re into adventure, not danger), reveling in the enormity of the ocean that surrounds them. While we’ve briefly mentioned that you’re likely to meet some of Key Largo’s most inquisitive creatures a ways away from the shore, there’s no doubt that you’ll run into some curious critters when you paddle along Key Largo’s inland waterways. The Keys are home to some of the world’s most unique wildlife, many of which love to make appearances for intrepid paddlers. It’s entirely possible to get a good view of Key Largo’s Key deer, woodrats, and even the American crocodile. Ah, the vacation mindset: indulge, indulge, sleep, indulge, repeat. While we’re proponents of the hedonism vacations often spur, it’s never a bad idea to incorporate a healthy activity to offset the pounds of fried goodness and boozy drinks you’re sure to ingest during your stay on the Keys — and kayaking is an excellent way to burn off some of those coastal calories and sweat out that hangover. Not only is kayaking a great way to keep your arms in shape during your vacation, but it’s also great for maintaining and strengthening your core strength and getting your heart rate up. So, eat, drink, and be merry, friends! Keys Skis’ kayak rentals are your excuse to chow down, drink up, and stay (relatively) in shape during your holiday. This one might be a bit subjective, as we’re completely biased, but kayaking is one of the most fun and entertaining water-faring activities you can do. Whether you choose to take your kayak into the Atlantic, Gulf, or inland waterways, you’re sure to have a blast slicing through the gentle waves and gliding on to your destination — that is, if you have one. Part of the fun of renting a kayak is paddling aimlessly, taking in all of the sights, sounds, and sensations that are only found in Key Largo. Whether you choose to go it alone, or you’re bringing your partner, family, or friends, kayak rental from Keys Skis is the best way to experience the surrounding waters. Have questions, comments, or concerns about what all Keys Skis has to offer visitors to our little slice of paradise? Curious about how to get started on your next kayak rental from Keys Skis? Excellent! Don’t hesitate to give us a call or click to book your next kayak adventure.